With my interview series “A talk with” I want to share stories behind the artists and persons who are involved with my label “Sitflip”. Tatjana Hardikov is a fine Arts painter from Vienna I’ve worked with from the beginning of Sitflip. It was also her work, especially the ones on Skateboards, who inspired me to make Sitflip into a platform for Art. So that’s why I’m proud and happy to start with Tatjana. 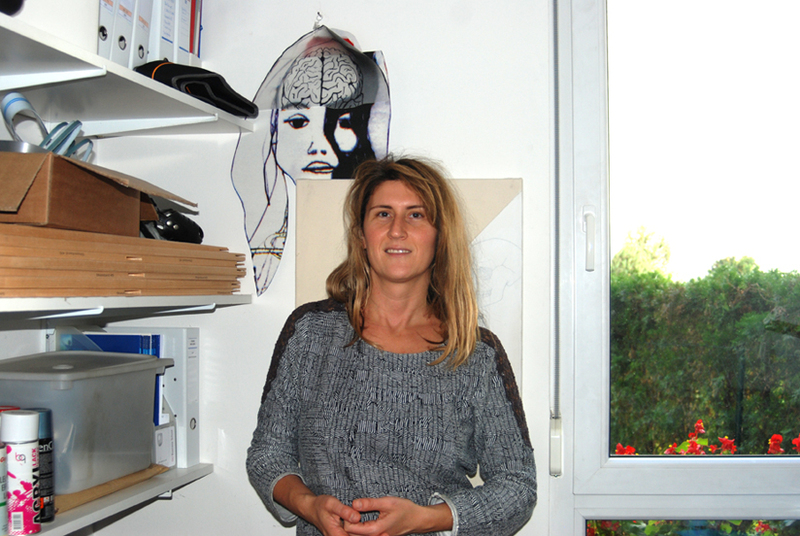 Tatjana Hardikov’s varied work ranges from drawings, canvasses, painted skateboards to installations and work on walls. 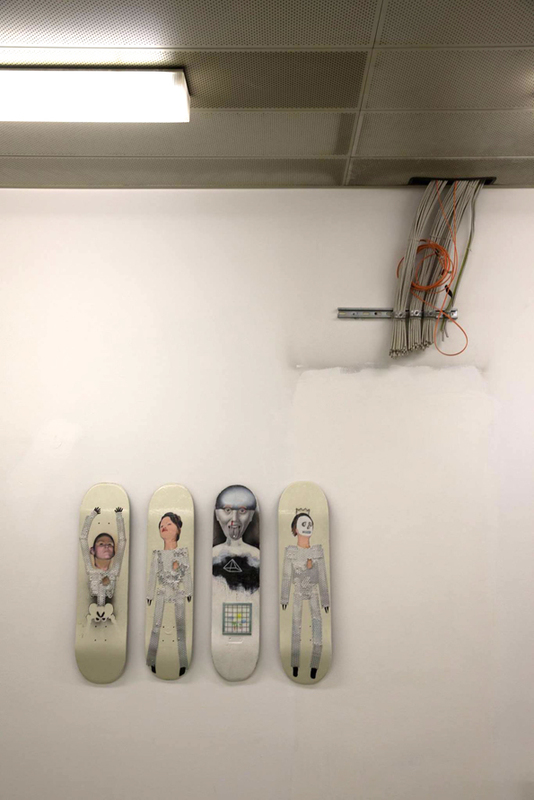 In occasion to her recent exhibition at the Parallel Vienna this year we’ve had a talk about her latest pieces, the ways she works and the relation between Art and Skateboarding. You’ve participated at this years edition of the Parallel Vienna Art fair which took place in the old building of the Sigmund Freud University. This brings me directly to one of the major themes I see in your works – they seem to deal a lot with the concept of unconsciousness. What kind of themes are you interested the most? Unconsciousness and intuition are certainly a big part of my theme, but also the beginning and the ending of life. For us everything seems to be taken as given. If you observe that with a kind of distance you see how complex, endless and perfect everything is working. The white space is very prevalent in your works. It occupies an evenly important space as the things depicted. It’s like you give us a glimpse to a vast universe open to imagination. One could falsely think that your works seem kind of unfinished, like sketches – but this white space makes everything stronger. Could you explain why you use white space in your works? I think I never really payed attention to that. The white space is certainly a calming and cleaning pole for me. My characters are often in a very emotional and sometimes even stressed situation which would be overloaded with distracting elements. I think, I try to focus the theme and give my characters the space they need. Process, transience, change, imagination and becoming: is openness a fundamental element of your works? Once you’ve told me that you where introduced to paint on Skateboards by your brother, since he gave you his old boards. What do you see in Skateboarding? What did intrigue you to use them as a medium? Skateboarding was very popular in my youth, so I knew a lot of friends who were Skateboarding. When my brother started, it was already part of my youth culture. After editing the first blank board I was surprised: It looked like a modern icon! By the way, that´s why I painted saints all the time on the beginning. Fortunately I extended my ideas! So from this moment I started to work with broken, discarded and useless boards. Sometimes I see that Skateboarders are a very self-contained group of people being very restricted. You have to be a Skater yourself to get the “license” to work with it. I think it´s due to my brother, who is so much assimilated to Vienna´s Skater-clique, that I have the blessing of doing Art with this “holy” support. Now, after so many years of working with Skateboards, it became also part of my “garbage-art” in which I work only with trash, like the “Animal” during the Parallel which is made by littered shards. Can you explain the “Animal” to the ones who couldn’t attend the Parallel Vienna? What did you present at the exhibition? I found some used shards in my fathers garden – they were already mossy and dirty from being exposed in nature. 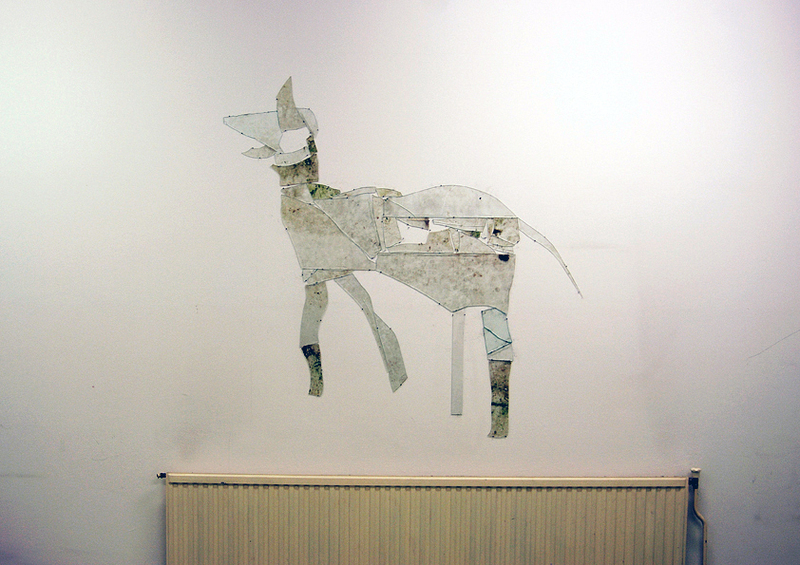 With those pieces I tried to build an animal which looks finally like a bigger dog or a deer (depending of the viewer). The shards made a kind of tender hardness effect. That wasn’t my intention but at the end I was surprised by myself, because I did not know what will come out of the “puzzle”. It’s known that the acclaimed painter Arnulf Rainer used to over-paint old canvases because of scarcity in his early career. This technique then resulted in his famous „Übermalungen“ – a completely new genre. Do you see it differently working on Skateboards now as like in the beginning of your career? I did not start to work on Skateboards because of scarcity, but because of the satisfying results of my ideas. Painting over a frayed and destroyed board, even if there was a design before, has an upgrading meaning for me. But it´s true that I see it different now, as I said before, because I consciously choose garbage for making art. When looking at the skateboards, it is surprising that they all feature bodies and faces. Skateboarding has everything to do with the whole body. But still, 80% of an accomplished trick happens in the head. Any comments on that statement? 80%!!! I didn´t know. Maybe that´s why I need so long to finish one board… after painting and repainting over it! But at the end they look plastically and that´s exactly the effect I want. I hope you feel the same with your tricks! You often work in series. You do that because you want to tell a story or is it more about the different aspects of a particular theme or motif you want to explore? Yes, I think it´s more the process of representing different aspects and trying to shed lights on something particular. Let’s talk a bit about Vienna. What’s the best about living and working in this city? Do you think the city influences your work? Vienna became my homeland although I feel my roots in Croatia and Russia very strongly. But I would never go back to my mother(Croatia)-father(Russia)-land. I incredibly appreciate the possibility to live here and be part of an open minded society which is more or less firm and safe. I know the country’s where my parents come from and I´m sure that I would never had the possibility to develop myself and my artwork in this free and diverse way as I did here in Vienna and especially on the Academy. How did making Art change since you’ve started? Do you have certain working methods which stayed the same during the years or are you always changing your approach? I think I found my theme and my style and I just continuously improve and refine my technique and my presentation. So, for example, I started to work with installations, to paint on the wall and to include the exhibition room in telling a story. But it´s also true, that after the birth of my son, I noticed a changing to my approach to Art which became less individual then before and more responsible in a general way. Maybe it´s because I started to see the world trough 4 eyes and not only through 2 eyes, what has broadened my approach. Through that I get more views on one matter and not only the one I unconsciously never questioned. Referring to my Art, I stopped seeing myself as a center of my life and thereby I could draw more then just about me and my thoughts. You often work with texts and collages. It is seldom to see a work of yours where you just use one technique. Is there any you prefer amongst others though and do you have something like a favorite material? 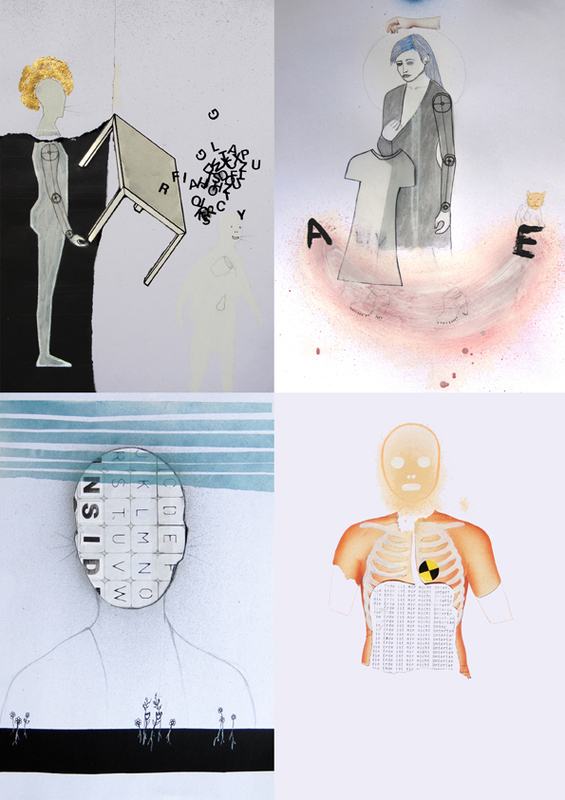 The diversity of material I use, was unconsciously the effort to show the many elements I wan´t to illustrate. So every subject had to be accentuated differently. Mixing techniques is like representing layers of us and the world in which we respond. Your last works show a bigger tendency towards a more minimalistic approach. How would you describe your current approach to someone who doesn’t know your work? At what are you working right now? I would like to continue and develop my work with shards on the wall. This experience during Parallel was fantastic, because somehow it’s an extension of my usual work – only bigger, stronger and more impressive. What was your motivation to get involved in Art? Nothing, I felt as an artist as long as I can think, I started to draw and paint as a young teenager. What role do you think Art has in a world where talks about crisis and austerity are so prevalent? What do you think is the role of the artist in nowadays society? I started my career as an artist when the crisis was already on the top. So the demand to live and earn money 100% from art was unrealistic. Finding a compromise with working for money and not being dependent of success, which is often guided by others was hard on the beginning and very liberating after a while. I think if you wan´t to work, you will find ways to do. Anyway there is no escape. Do you think there are similarities between the Art world and the Skateboard world? Yes, I think Skateboarders are also looking for freedom and liberty and they stand for openness. Both have an observing and also critical view to the world although the Artist is more the brooding type. Skateboarders enjoy the moment of life, that seems to me. They are social, amicable what is not always naturally with Artists. But for both sides Art (including music, movies, fashion…) is indispensable to life.